“You remain the father of the nation, our father and political father to all. Just like i told Asiwaju Bola Ahmed Tinubu and Vice President Osinbanjo yesterday in Nigeria… Those who think that they have politically grown to insult you will all regret it before month end sir. I am here (London) to register my undiluted love and unalloyed support to you. I was involved in all their meetings and I know what their plans are. 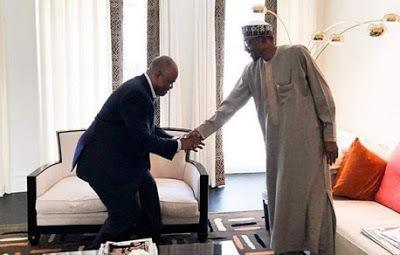 The long recess of NASS is going to be your advantage and not theirs like they thought and planned”- Senator Godswill Akpabio to President Muhammadu Buhari. If he believes that then he is not half as intelligent as I once thought. Buhari is not a man of honor, he is not a worthy ally, he does not keep to his pronlmises and he does not have friends. The only friend he has is his insatiable lust for power which he feeds on a daily basis. The fact of the mattee is that Akpabio deserves to be pitied. He is more worthy of pathos than wrath because, like Judas Iscariot and those that betrayed and crucified Our Lord and Saviour Jesus Christ, he “knows not what he does”.